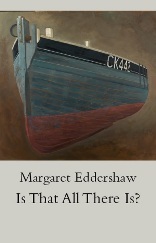 I recently had the good fortune to hear Margaret Eddershaw reading from her new collection, at a triple launch of Mica Press poetry books at the wonderful Wivenhoe Bookshop. So it is indeed a great pleasure to review Is That All There Is? with its impressive and moving poems that are testament to the writer’s far-flung travels and which give us sights and flavours of a kaleidoscope of exotic places. The cover design by Leslie Bell displays a photo of one of the beautiful boat paintings of acclaimed Wivenhoe artist James Dodds. until in a final fourth stanza we are let down gently, “soft as a feather in a draught / to leave footprints / in Copacabana’s caster sugar sand”. A lovely feeling. yet she had human teeth. my child is heavy as granite. What an invigorating collection. Well done Margaret Eddershaw. Well done Mica Press. Recommended. What a lovely, well-tempered, appreciative piece of writing Peter Kennedy. A good book is well served by an alert reviewer.